While this year’s early season slate did not feature a long list of big names, in part due to Syracuse not appearing in a significant tournament, SU’s schedule has been a solid proving ground for a team that entered the season with plenty of question marks. The Orange currently stand 8-1 with that lone loss coming to pre-season Final Four contender Kansas and, while losing by 16 points is not a good thing, Syracuse fighting back from 21 points down to get within seven, then coming back to get within shouting distance with four minutes to play in the second half before going bone dry on offense was a good sign. SU also claimed victories over the other brand name teams they have played, withstanding every Maryland push to defeat the Terps and overcoming some significantly sloppy play to defeat Connecticut. 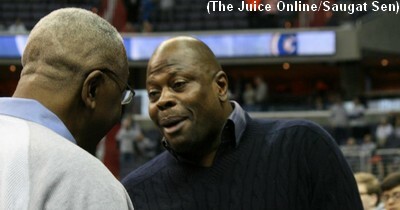 And they have one more big name foe on the horizon in historical rival Georgetown. 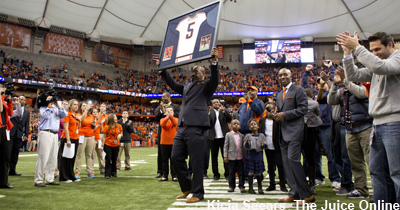 But after Saturday’s game with the Hoyas, Syracuse’s work is not done. Before the ACC season kicks in, the schedule has a couple of Mid-American Conference foes, Buffalo and Eastern Michigan, sandwiching in-state opponent St. Bonaventure. And while those contests won’t come with the cache and prime television slots that came with those bigger names, they’re just as big of games for the Orange. Buffalo stands 6-3 on the season, but their defeats are neutral-court losses to then-#12 Cincinnati and San Diego State and a home loss to St. Bonaventure. Ken Pomeroy has Buffalo as a solid team at #132 in the nation with all three of those losses coming against teams ranked in the top 70 in the country. The Sagarin rankings think even better of the Bulls, slotting them at #109. On the floor, the Bulls have a couple of characteristics that SU will have to deal with. Buffalo shoots a pretty high number of three-pointers (nearly 42 percent of their field goal attempts) and do not turn the ball over a lot (71st of 351 teams in the nation). At a quick glance, that sets up to be a game where the 2-3 Orange zone will get tested. St. Bonaventure is the biggest potential land mine for SU. While the Bonnies currently stand at #68 in Pomeroy’s rankings, they can definitely see Syracuse not that far ahead of them at #57. The Bonnies are 7-2 overall with losses against TCU and Niagara, but have something in common with the Orange – a tight win over Maryland. Unlike SU, St. Bonaventure grabbed their win on a neutral floor, doing so without their top player, Jaylen Adams, who suffered a sprained ankle in an exhibition game. Adams has only been back for three games, but the last two make it look like he never left. The senior guard has piled up 45 points, 18 assists, and eight steals in those two contests. Of special note to the Orange is that Adams hit seven threes in those two outings. Oh, and his backcourt mate, Matt Mobley, is scoring 19.6 points per game and has hit 24 threes on the season. Tyus Battle and Frank Howard will have their work cut out for them in what may prove to be SU’s second-toughest non-conference game. Syracuse will close the non-conference portion of the schedule when Rob Murphy makes his seemingly annual trip back to the Carrier Dome with Eastern Michigan. Murphy, a former assistant of Jim Boeheim, has brought his Eagles to the Carrier Dome four times in his six seasons as the head coach at EMU. This year’s Eastern Michigan team is currently 7-2, but has gotten there without playing a particularly threatening schedule. One of the losses came at Indiana, but the other was at North Florida. However, EMU has also beaten Oakland, whom the Orange dispatched earlier this year (and will oddly play them again in the back end of a non-conference home-and-home series before coming to the Dome). What should concern the Orange, and you have undoubtedly heard this before, is Eastern Michigan’s 2-3 zone defense. It is the same defense SU runs and, of the seven players who have logged the most minutes for EMU, six stand at least 6’6”. 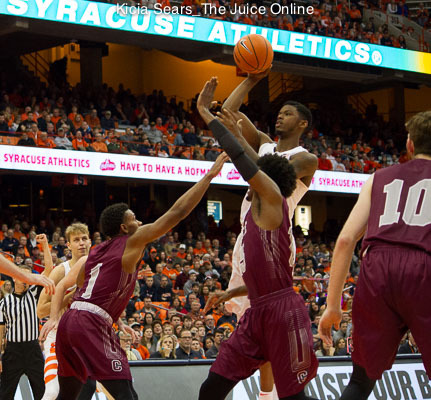 For a team that struggles as much as Syracuse has to this point of the season with perimeter shooting, facing a long 2-3 zone could make for a long evening at the Carrier Dome. Also of note are the Eagles’ top two scorers, forwards Elijah Minnie and James Thompson IV. The two combine for 35.6 points and just under 20 rebounds per game (Thompson IV has eight double-doubles on the season with Indiana limiting him to ten points and eight boards.). The two have also combined for 28 blocks on the season, so the Syracuse front line could also be in for a stiff test that night. Even though the last three non-conference names are not flashy, the games could be trouble. But, if the Orange can run the rest of the non-ACC table, they would be 12-1 on the season with their only loss being to a national heavyweight. That would go a long way toward getting Syracuse what they really want – back in the NCAA Tournament.